I agree about the lure of a series, Christine. 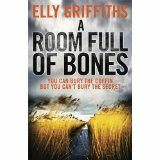 I love Elly Griffiths’ books & a lot of that is to do with catching up with Ruth, Harry, Cathbad etc. I enjoy the mystery plots but I think EG has been very clever at keeping the reader on tenterhooks about Ruth & Harry’s relationship. I also enjoy Martin Edwards’ Lake District series & Cynthia Harrod-Eagles’ Bill Slider books for the same reason. There’s a comforting feeling of meeting up with old friends plus a new mystery to unravel. Yes, that’s exactly it, Lyn. And it’s lovely when you discovered a new series and know that there are lots of treats ahead. Thanks, Sally. Good to hear from you and I hope all is well.Sarah was a guest on my blog a while ago and she wrote one of my favourite theatrical novels, Ghost Song, terrifically atmospheric. Wonderful Maigret – now that I have an e-reader with a downloaded French dictionary I can just about manage them in French.